I wanted another opportunity to play with the white winter playdough again. We've already made snowmen with it, and Little O has played with it independently at her desk. I decided to pull out the same accessories we used for the snowmen and add some circle and heart-shaped cookie cutters. 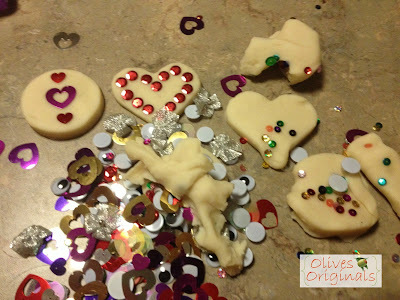 Little O couldn't get the hang of rolling the playdough flat, but she enjoyed mushing it with her hands and ripping it apart. Great work to develop those fine motor skills! Once I rolled my dough flat, she was interested in helping push the cookie cutters into it. I cut out two circles and two hearts for each of us to play with. I wound up with one heart and one circle, and she got the rest. 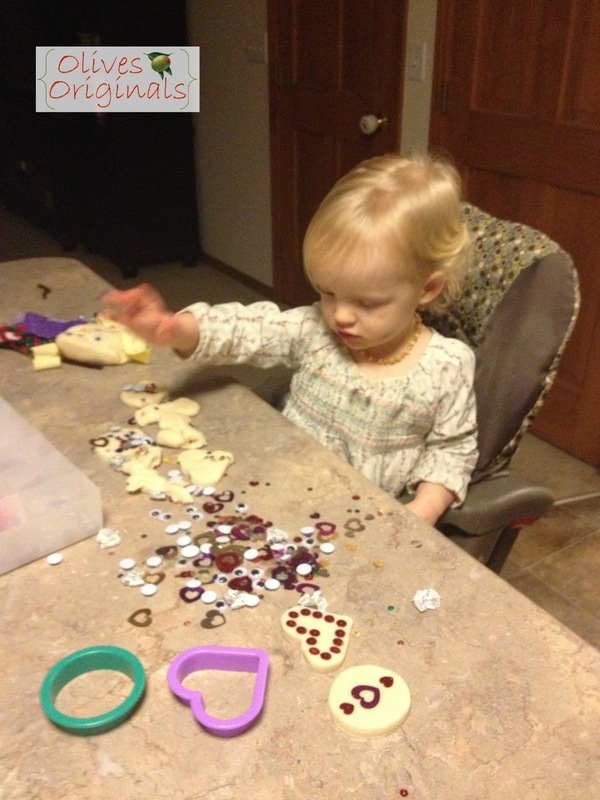 I made sure she could reach the decorating supplies: buttons, sequins, heart-shaped sequins, bows, and googly eyes. Then I started decorating mine. She got the idea pretty quickly. She really liked the small, multicolored sequins. 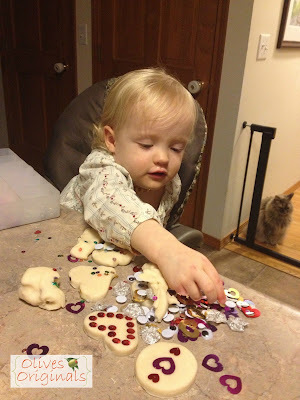 She grabbed handfuls at a time and sprinkled them onto her cookies. She also enjoyed taking the supplies out of the box and putting them in a pile. I had to let go of my OCD tendencies for this. It is Ok that she mixed the sequins and the googly eyes. It's is. In the end, this is what we wound up with. 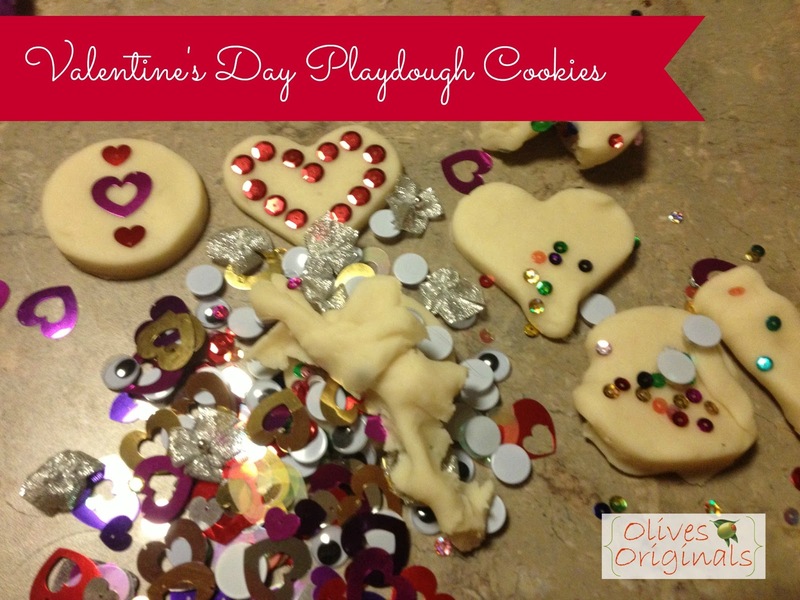 They are not beautiful, Pinterest-perfect playdough cookies. But they are perfect to Little O and to me. Process. Not product.